Start the payment process by swiping your card, just as you do today. 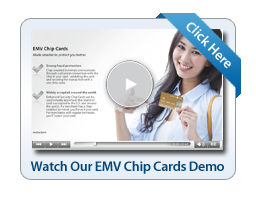 If a merchant's terminal is chip-enabled you'll be prompted to insert your card. If a merchant isn't using a chip-enabled terminal yet, the transaction will process as it normally does. Follow the instructions on the screen and either sign your name or enter your PIN as needed. Be sure to remove your card and take your receipt when the transaction is complete. The process is essentially the same as at a merchant. Insert your chip card into the ATM and follow the instructions on the screen. Depending on the type of ATM, you might be prompted to re-insert your card. Leave the card in the ATM until the transaction is complete and the card is released. Then remove your card and any cash you may have withdrawn. A PIN is needed for ATM transactions. Nothing has changed for the transactions made online or by telephone, so you'll make payments just as you do today.